I mean, if someone were to buy me an original Action Comics #1, I wouldn’t say no. So for this week’s Question Time over at ye olde Trouble with Comics, we were asked about the greatest comics gift we’d ever received. (You can read Alan’s response, posted separately as a Stan Lee’s Birthday special). As per usual, I delved into the inquiry at length, relating a gift I received when I was but a young Mikester. But it got me thinking about the number of comic book gifts I actually have received over the years. As I say in my excessive preamble to the response over at TWC, I usually didn’t get comics as gifts because either 1) I bought what I wanted during my trips to the comic shop, or 2) I bought what I wanted during my work hours at the comic shop. I sorta feel funny asking other people to buy me comics, a habit that continues to this day as I was recently admonished for not informing a certain significant other that a book set I’m thinking about buying for myself could have been a good Christmas gift for her to get for me. That said, there have been a couple of comic book presents I’ve received over the years. The most recent were a handful of Starman trade paperbacks, catching me up on the James Robinson series I’d just started reading, but that was some years ago. I had to have it. Several classic Barks stories, fully recolored, in a nearly 400 page volume that stands 13 inches tall. It’s something else. One thing I remember is that my mother, who used write inside any books purchased as gifts “to my son, Christmas ’82” or whatever, told me that she specifically didn’t write anything inside this book if I ever decided to resell it. Well, fat chance of that happening…even having nearly all the stories inside reprinted elsewhere, this is a special enough item that I don’t want to let it go. There’s even an introduction by George Lucas, with whom some of you may be familiar. 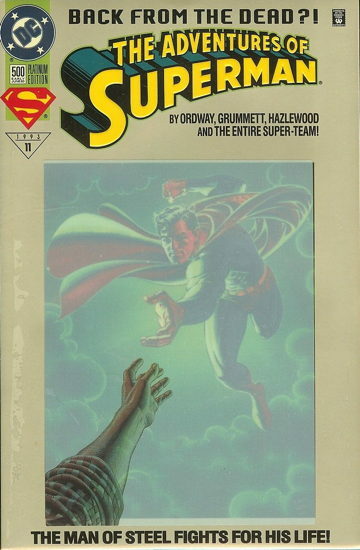 This extensive encyclopedia helped put some of the pieces together on Superman’s early adventures, which I was only getting here and there in assorted reprints. 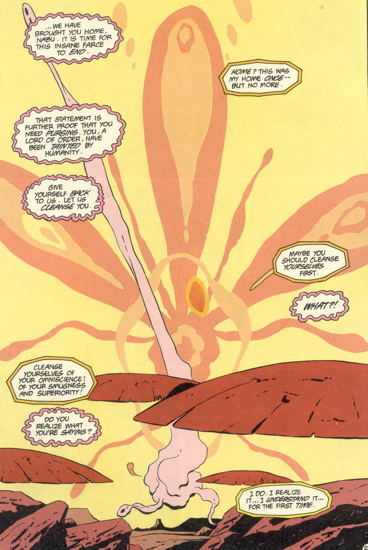 It certainly helped explain who, say, the Ultra-Humanite was, after I read his reappearance in a Justice League/Justice Society crossover event. And they’re not kidding about the “book length biography of Superman” — Superman’s entry, and nearly every other character’s entry, is essentially a chronological summary of purt’near every appearance of that character. 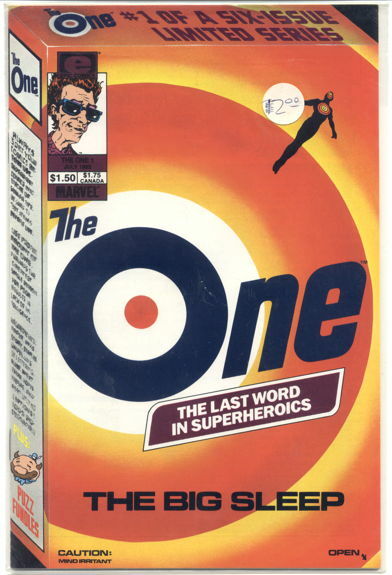 I spent many hours perusing this book, and it wasn’t so long ago that DC reprinted this in softcover, so you can check it out yourself if you’d like. This is a precursor, in a way, to the Marvel Universe/DC’s Who’s Who comics, though the Great Superman Book is a little more convenient in giving specific issue numbers for story events beyond just first or last appearances. One thing I found odd at the time was that the cut-off date for materials referenced in the book was, with few exceptions, the mid to late 1960s despite being published in 1978, but now that I think about the amount of time that had to be spent researching this book (i.e. the “seven years” they mention right on the cover), they had to draw the line at some point. 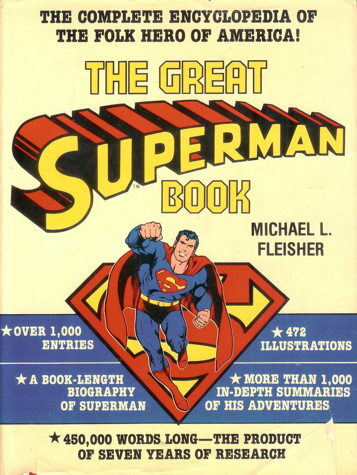 Still, sort of odd to have no entries for “Morgan Edge” or “Darkseid,” but this is still a wonderful reference book for the Golden and Silver Age adventures of Superman. There were others in this series, covering Batman and Wonder Woman (and also reprinted by DC in the last few years) but I don’t think I ever saw them in the wild when I was a kid. Which is just as well…just one of these volumes kept me busy enough. And I think that was it for funnybook presents. I mean, I did keep bugging Santa for a Yummy Fur #9, but I ended up having to buy it myself. Which is just as well, since I was beginning to get odd looks at the mall whenever I sat on Santa’s lap to ask for it. That goes for graphic novels/trade and hardcover collections as well. 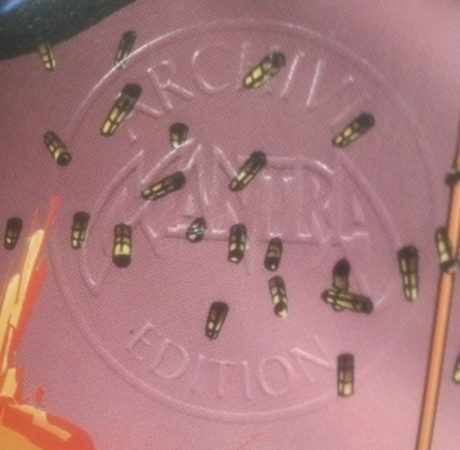 My plan was to replace some of the comics I gave up to the shop (like Preacher and Invisibles ) with the reprint collections eventually, but I’m in no great rush. Those particular titles aren’t in any danger of going out of print anytime soon, and even if they do, they should be in enough supply that copies will probably be available on Amazon forever. As for new collections, I’m trying to restrict myself to items I’d already been acquiring, like the Complete Peanuts books. Only one volume to go in the series, kinda dumb to stop now. There are collections I’d love to own, like the Eightball slipcase, but I already have all the comics (which I didn’t give up to the shop!) so I’ll just leave that on the shelf for someone else. This is an beautifully-illustrated ecological sci-fi adventure/treatise/poem-kinda-sorta by Stephen Murphy and Michael Zulli (and a small bit of material by Alan Moore) published in the mid-to-late 1980s. Some folks may remember the comic as being a bit of a pawn in a battle between its publisher, Dave Sim, and Diamond Comics. 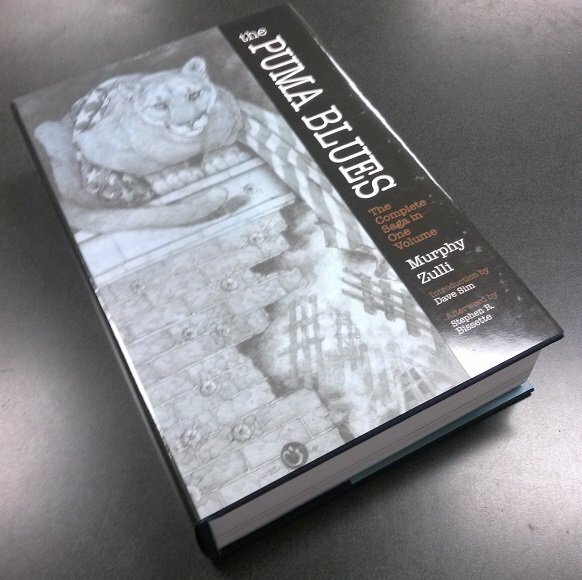 And, well, here it is, in my hot little hands, waiting for me to peruse it. 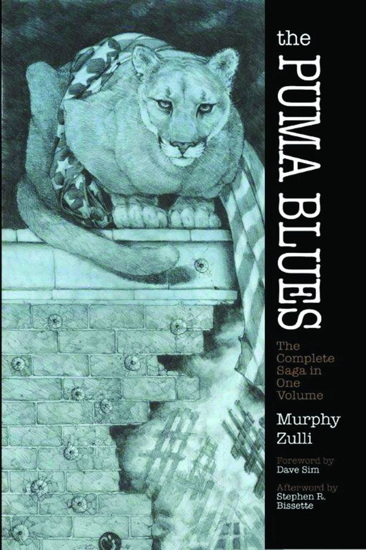 Also included is the Puma Blues #24 1/2 mini-comic, which I seem to recall having some copies floating around my old place of employment, though for the life of me I can’t remember how we got ’em. I have a vague memory that they were distributed with one of the original Puma Blues trade paperbacks. At any rate, I never got one, so that’s a little more added value to the book. Just briefly glancing through it, the reproduction seems nice and clear…no idea if it was shot from the original art, or scanned from printed pages, but it looks nice, especially now that it’s on white paper instead of newsprint (not that the newsprint was all that egregious). The original color covers are not reproduced…in fact, I’m not sure if the covers are in there at all, which is a shame as they were quite lovely. But overall, this is quite the tome and I’m glad to have it. If that Swamp Thing book existed, I would never fall behind on it. It’s not as if I get all that many comics, either. And I manage to make time to read the Peanuts reprints and last week’s release of Kate Beaton’s new book, so it’s not as if I have towers of unread runs of Those Other Avengers and Swamp Thing’s Kung-Fu Force teetering over me in my Gentleman’s Reading Room. Like I said, it’s a slow creep, a small stack getting gradually, almost imperceptibly higher each week, filling me with no small amount of nostalgic lament for the days when I’d bring home the week’s new comics, and just sit there and read ’em ’til I was done with the stack. Now I have my allotted comic reading time, where I read what I can until I have to go on and do whatever the next thing is. Okay, it’s not quite as regimented as that, but I’m a little more aware of the free time I have and more careful about how I spend it. Like spending an hour or so every other night writing a comics blog. The Maxx – Sam Keith and William Messner-Loebs’ weirdo Image comic from the early days of the company, now being reprinted issue-by-issue by IDW. 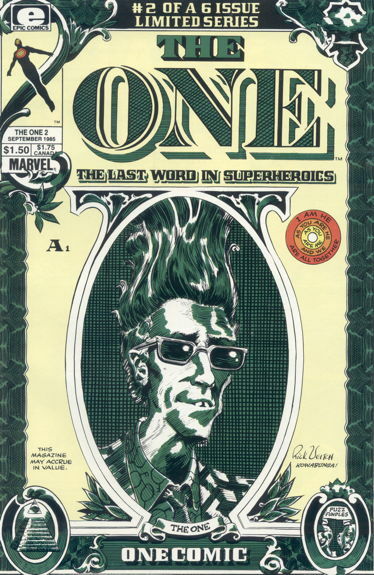 I read the first six issues of the original release back in the ’90s, and cut it from my reading list in a cost-saving measure, I think, and sort of regretted it ever since. I fell behind on reading the newest reprintings, but knowing this is a finite run makes it easier to deal with. I suspect this comic holds together better reading all together over a short period of time, anyway, rather than absorbing it in monthly installments. Haunted Horror and Weird Love – two of Craig Yoe’s bimonthly reprint series, which are great, don’t get me wrong. However, being as how most of the stories contained within date from a time when comic publishers weren’t scared of piling the text into each panel, it can take a little longer to properly appreciate each issue. Which is great…get that $3.99’s worth out of each installment, but sometimes they get sorted to the bottom of the pile as other, more current, more easily absorbed titles get read first. 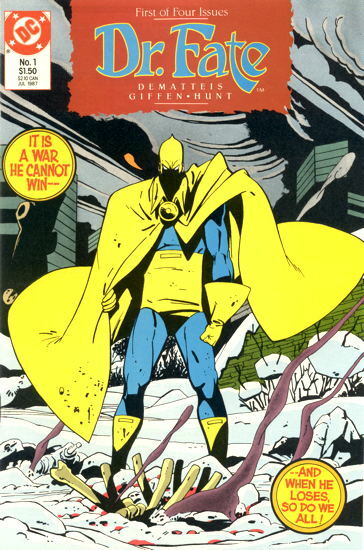 Miracleman – well, sure, I read ’em all the first time when Eclipse Comics published them decades ago, and still have those issues in what’s left of The No Longer Quite So Vast Mikester Comic Archives. I’m still buying the reprint issues, partially to appreciate the recoloring/remastering, partially to complain, and partially to support the series so that we can finally get the new Miracleman stories by Gaiman and Buckingham, picking up from where they left off twenty years ago, or whatever it was. Tends to get left for last because I don’t feel like prying off the mostly-unnecessary polybags. In conclusion, “a bloo-bloo, I don’t have time to read my funnybooks,” which is the whiniest of my complaints ever. I think I’m in good shape, though, so long as I don’t backlog myself into a warehouse full of boxes filled of unread comics, awaiting that day I’m bedridden with some horrible yet non-reading-impairing illness that will allow me to catch up. And that’s just comics. Here’s a stack of hardcovers sitting on an endtable in the bedroom, and the Netflix queue, and…ugh, someone tell the Grim Reaper I can’t fit death into my schedule for the next few decades, I have too much entertainment to follow. This week’s Question Time over at Trouble with Comics addresses the most terrifying of queries: “DO COMICS MATTER?” The answer is of course, NO WAY, NUH UH, FORGEDDABOUDIT…well, okay, we all say they do, more or less. SPOILERS. Also, this time around everyone’s question is put up as a separate blog entry, so this little ol’ link here to this week’s question time should take you to all of them. You’ll need to scroll down a bit to see mine…stop when you find that one somewhat familiar picture of me (which has been altered ever so lightly). In which Mike refers to himself in the third person a little too much at the start. Sorry for missing out on my usual Monday post…turns out Sunday night your pal Mike’s body said “NO BLOGGING, MUST SLEEP,” and I had to give it a pass. I looked around the shop a bit, looking for a copy of the first issue. When I couldn’t find it, I put the request in to Ralph (the shop owner and, a few years after this, my boss) for that initial issue. He didn’t have it available just then, but said he’d try to get one for me. Until finally, one week, I asked if it were in again and Ralph replies “YES! Yes, I have it! Here you go!” and hands me a copy. With a twelve dollar price tag on the bag. I know I said “…uh….” I’m sure I blanched a little. As cheap as I am now, I was even cheaper then and I certainly wasn’t expecting that price for the comic. And then Ralph laughed at my reaction and quickly scratched the “1” out of the price, making the comic two bucks. And thus I learned my les…okay, I didn’t learn anything. Well, except to do similar pranks to my own customers, but that was still a few years away. I’ve even replaced the bag on that comic at some point since then, carefully removing the sticker from the old bag and placing it on the new one. 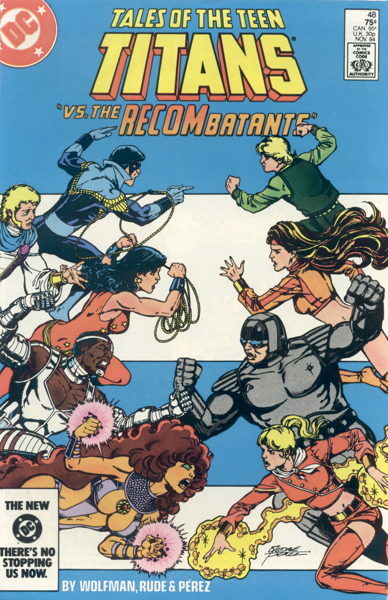 According to the most recent price guide, near mint copies of this comic now price out at $3.00. Hah, I got this comic out from under Ralph for only 2/3rds guide! What a (thirty-years-in-the-making) deal! When I initially opened my shop, I was primarily feeding the back issue bins with comics from my own collection…sure, there was the odd long box or two I picked up along the way, but a lot of the books were collected by my own hands, picked up once a week at ye olde comick shoppe (later ye olde place of employmente). I was, and still am, by and large, okay with parting with most of the stuff…I’ve read and enjoyed it all — well, enjoyed most of it, anyway — and I don’t mind it going to new homes for new folks to enjoy. And some stuff (like, say, Preacher ) I can always get in reprint form. I’ve noted before that not everything went into the shop. Obviously I kept my Swamp Thing comics…I mean, duh. My Don Rosa Disney comics I didn’t have otherwise reprinted. My Groo the Wanderers. My Cerebus. That full run of Yummy Fur I finally finished and am selling over my dead body. And so on. But there are a few things that I put on the tables at the shop that I kind of regretted, and as I’ve acquired more collections and filled up more of the store with a wider selection of back issues (and not just “whatever Mike was reading when he was in high school”), I’ve felt like I can take back some books I planned on sacrificing to the greater good and return them to the personal collection. Not that I’ve done it very often…the odd book here and there, DC’s Who’s Who , that’s about it. Not anything that was really selling at the shop anyway. …Like, as I said above, Dr. Fate . 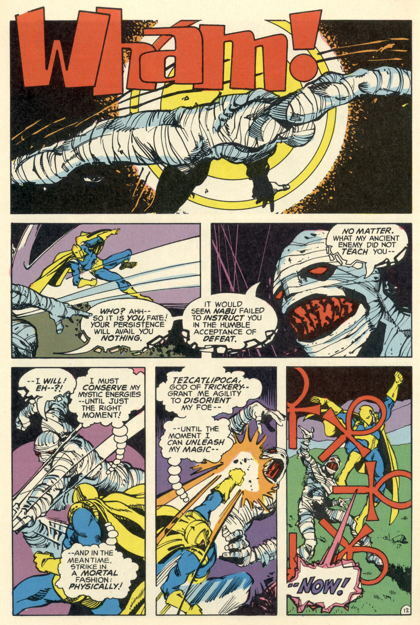 …which features Keith Giffen’s art to better effect on the nice white Baxter paper than it did in its original newsprint presentation, which had lots of color holds and heavy inks and other visual hoohar that kind of got lost in translation initially. …which makes complete sense in context, I promise. That’s not a typical cover for the series…usually it’s line-drawn images, but I always liked that weird cover so there it is, representing the ongoing series on this here website. With issue #25 William Messner-Loebs, Vince Giarrano and Peter Gross come on board, and…if memory serves, it’s not quite as bonkers the preceding 24 issues, but it’s still not bad. Can probably stand to reread the series and refresh my recollections of it, but if only I had a full run of…oh, wait, I do! I can’t believe my good fortune. 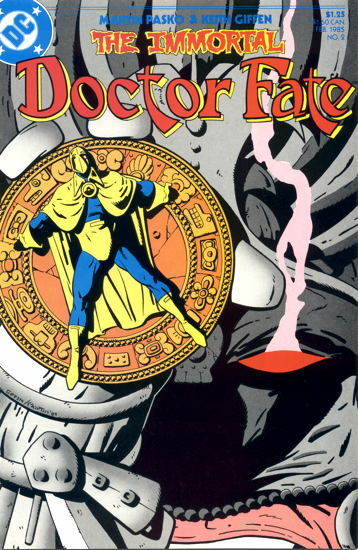 …Of course, this will be the week someone charges into my shop, waving a fistful of hundred dollar bills in his hand, demanding that he be able to buy full runs of the above Doctor Fate series right this instant. It’s always the 1990s here on Progressive Ruin Dot Com. So being in the comics retail industry in a location close to where Malibu Comics’s home base was located when it was active, we’ve seen a lot of the material produced by that company. And I don’t mean just the regular stuff, but promotional material, rare items, and just lots ‘n’ bundles of multiple copies of various products. I remember at one point obtaining what must have been a case of The Trouble with Girls graphic novels. …and I was all set to write up a whole post about this, but just like two weeks ago this Ultraverse blog already put together a far better and more informative post about this very thing than I would have. 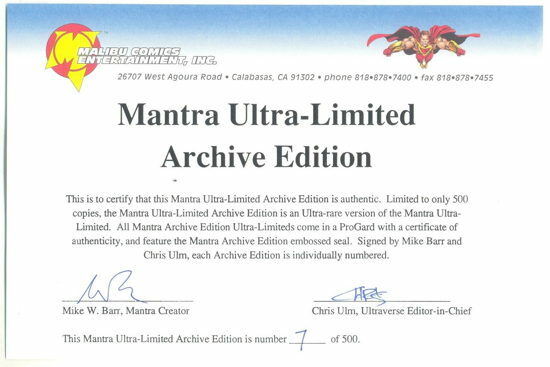 The thing I learned from that post I found most interesting was that, despite the certificate stating “limited to 500 copies,” far fewer than that were actually created and distributed. The number given is about 30, though the picture in that blog post shows a certificate numbered 134, but who knows what kind of numbering shenanigans were going on. Perhaps earlier numbers were being reserved for employees and other special persons, since the copy in my hands is #7. Anyway, I put it on the eBays to see who’d salute, so we’ll see how it goes. It’s kind of a drag that someone had this pinned up on a wall, apparently, as there are a couple of pinholes in the top center of the polybag…who’d buy a “hot, rare collectible” in a time where “hot, rare collectibles” were the be-all, end-all of the comics retail industry and then pin the sucker on a wall? That seems almost counter-intuitive to the investment mentality running rampant in the business then. It even had the $125(!) price tag still affixed to the comic bag it was being stored in. This is one of those “pro-graded” slabbed copies, where they apparently removed the polybag before sealing the funnybook into its little plastic coffin. 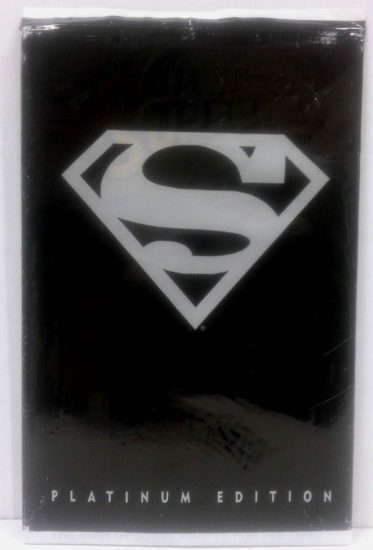 The color of this cover may be dimmed a bit, as you’re seeing it through about 1/16 inch or so of plastic, but that is definitely a “platinum” (well, silvery-whitish) version of a cover that is normally black. Plus it says “platinum” in the corner and they wouldn’t print it if it weren’t true. Another difference is that the logo on the platinum version features raised lettering while the regular version does not, a fact I just now went to check with my copy of the non-platinum version down in the No-Longer-Quite-As-Vast Mikester Comic Archives. 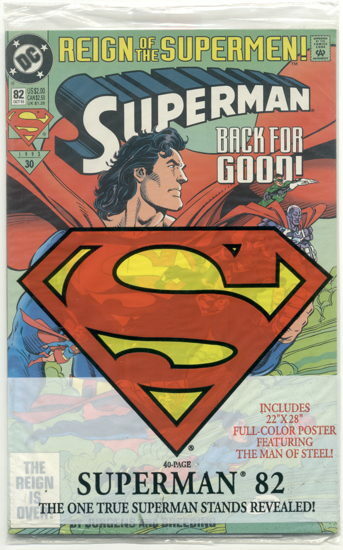 …which is the regular cover edition Superman #82, which also had a chromium cover. However, this version of #82 polybagged with a poster was, according to my two seconds of Google research, a Walmart variant which I don’t believe I’d seen before. No UPC code on the comic cover, but said code was provided on the back of the bag itself. 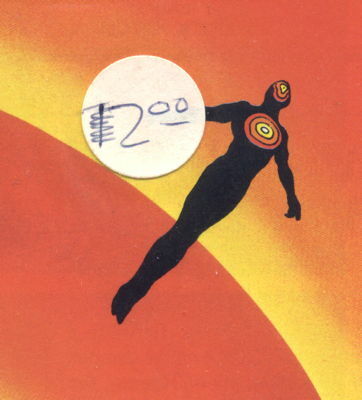 I don’t know what the poster itself looks like…my guess is that it’s that cover, but maybe someone can let me know. Twenty-plus years on, I’m still talking about the Death of Superman. Let us look forward to a happy 2015 and, with any luck, even more posts about the Death of Superman. See you then, friends. I’ve collected comics for less reason…well, okay, I haven’t. I am an insanely easy mark, sometimes. This was a hard run of comics to give up to the shop, but it helps that I recently just reread the early “prime” issues of the Wolfman/Perez run, up to about issue 50 or so, enough to realize that if I really want to keep these stories around for posterity, I’m going to want to invest in one of the recent reprint volumes. I don’t know if you’ve looked at your copies of those earliest issues lately, but time and paper stock has not been kind to the printing on those. Or maybe it’s just a decline in my own eyesight, but that would mean I’m aging and clearly that’s not possible. My pricing of the Titans comics hasn’t quite reached this issue yet, which, if you haven’t read the “Titans Hunt” storyline, was a much-needed revitalization of the Titans franchise, and really kept you on the edge of your seat wondering what was going to happen next. It honestly did feel like “anything goes” and had an energy to it that the series hadn’t had since its earlier days. The storyline certainly made me a fan of artist Tom Grummett, who I think was probably the best artist on the series aside from Perez. Hopefully I didn’t just talk myself into keeping those comics, too. My post about shipping to prisons resulted in a couple of people contributing their own stories on the topic that I think you might enjoy reading. I certainly found them interesting. Special thanks to ProgRuin reader/commenter Walaka for dropping by the store over the weekend! Always happy to meet in person my online friends! Eight out of ten ain’t bad. 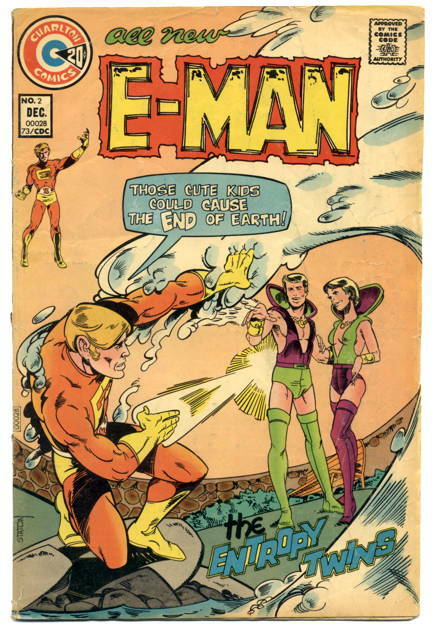 So I made good on my promise…well, my passing whim, at any rate…and dug deep into the back issue bins at the store to pull out a set of the 1970s Charlton run of E-Man . Most of it, at any rate. We had several copies of some issues, in a wide range of conditions, but alas, issues 8 and 10 were not to be found. Sure, I could have settled for the reprints of those original issues First published later, but given the choice, I’m going for the older books, what with the swell covers and the tanned pages and the terrible ads and what have you. Speaking of the eBay, it’s probably to the Internet auctionings I go to fill out the run, unless I’ve got #8 and #10 hiding in the backroom of the shop somewhere (and given the “abandon all hope, ye who enter here” state of the backroom, it’s not unlikely). It does look like we have all of the First Comics series, and then things get a tad complicated after that, looking at the Wikipedia page. Then there’s all the Mike Mauser stuff, Mauser being a private detective supporting character in E-Man and having his own back-up series in Charlton’s Vengeance Squad . 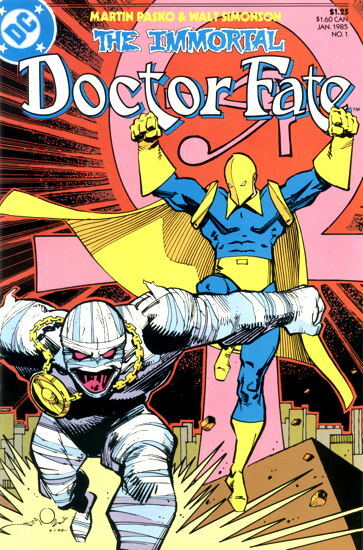 I think we have those at the shop, but those are also reprinted along with the original E-Man stories by First Comics, and that series also has some previously unpublished work and now I’m thinking I should have just taken home the reprints instead. AAARGH. Now I’m waffling. I may bring back the originals and go for the reprints. 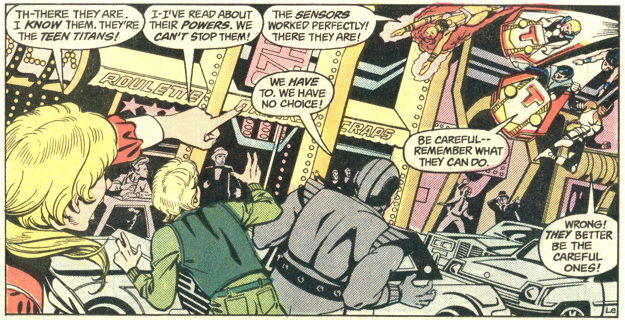 But the originals have the cool Ditko back-ups. Man, these big decisions are the worst. I’m going to end up buying both versions and hating myself. LOOK WHAT YOU’VE MADE ME DO. 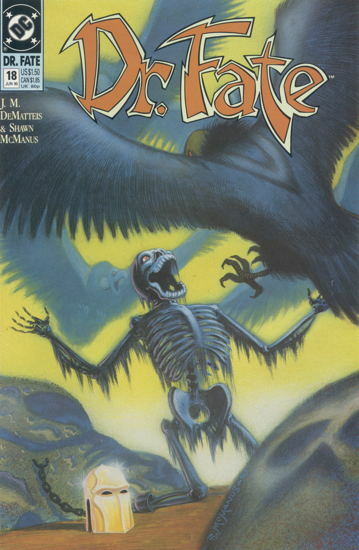 There was also a series teaming up Mike Mauser with Ms. Tree, Ms. Tree being a series I did read and I tell you right now, without checking my inventory list, I couldn’t tell you with any confidence whether or not I own that mini. I’ve seen it at the shop plenty of times, but my memory tells me I didn’t pick it up because I wasn’t familiar or just indifferent to Mauser, but my collector-fanboy-sense tells me I did pick it up because it’s a Ms. Tree tie-in. I have no idea. Okay, hold on for a second, I’ll check. Looks like I don’t have ’em. Well, I guess if reading E-Man is going to turn me into a Mike Mauser completist, I guess I’d better pick those up at some point, too and fill out that Ms. Tree collection at the same time. Now, all I have to do is find time to read all these. I’m sure that’ll be no problem. I’ve almost made it through #1! Gang of street toughs closely stalking the Black Cat, or promo image for a new wave band? Anyway, that’s not what I originally planned this post to be about. 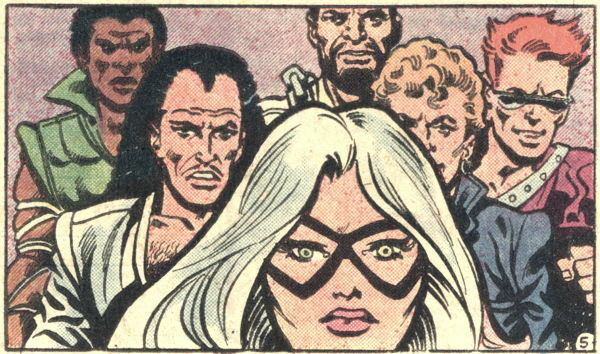 This image was taken from Peter Parker The Spectacular Spider-Man #90, cover-dated May 1984, and is notable primarily for being one of the first appearances of Spidey’s then-new black costume. The subject came to mind when, on our store’s Facebook page, a customer questioned an assertion I made on our regular website that Amazing Spider-Man #252 was the black costume’s first appearance. “Isn’t it Secret Wars #8?” he wondered, and I explained that even though Spider-Man is shown first receiving the costume in SW #8, that is actually a good seven months or so after the costume made its debut in ASM. However, even that’s apparently not cut ‘n’ dried, since in Overstreet it’s noted that ASM #252, the aforementioned Peter Parker #90, and Marvel Team-Up #141 are “tied” (Overstreet’s terminology) for the costume’s first appearance. Today’s Marvel is more than happy to crank out four or five or six Avengers or X-Men titles the same week, but it was my memory that wasn’t Marvel’s habit way back when, when all these comics were hitting the stands. So it had me wondering, even though they’re all cover-dated May 1984, did they all come out the same week, or on succeeding weeks, and which one was first? Alas, though our store was open then, those invoices/cycle sheets/what-have-yous were discarded long ago. A little Googling finds some discussion (like this example), based mostly on “I-was-there” memories, plus additional blurring of the costume’s history with the inclusion of prior promo pieces from Marvel’s news/interviews comic Marvel Age and elsewhere. According to the information provided by Marvel, Amazing Spider-Man #252 was at least planned to ship out at least two weeks before the other books, making this the first in-story appearance of the black costume. This is of course assuming things worked out the way they should have. Shipments could have been delayed, books might have been late, etc. etc., so it is within the realm of possibility that some of the books may have been released, at least in some locales, simultaneously. And then there’s the fact comic shops in the direct sales market received their books weeks prior to newsstands. I wasn’t on the business side of the counter in those days, but my memory is that direct shipping of new books wasn’t quite the exact science it is today, he said half-sarcastically, so again, it’s possible that even if the books stuck to Marvel’s schedule, who knows what order they showed up in which comic book stores. On top of that, there was the usual speculation/hoarding shenanigans that turn up whenever something in the comic market smells like it could be “hot,” so it wouldn’t surprise me at all if some people remember seeing Marvel Team-Up #141 before Amazing #252, since all the 252s were immediately scooped up, bagged, boarded, and thrown in boxes marked “DO NOT OPEN ‘TIL EBAY.” And even beyond that, the disparity between new arrivals in comic shops and new arrivals on newsstands could have meant people spotting the latter Spidey books at their comic shops before seeing #252 pop up at the local 7-11. Anyway, I wish I knew back then I’d be writing this blog today, so that I’d have taken better notes. As it is, at the time I did buy Amazing Spider-Man #252, from a newsstand no less, because I was semi-collecting that series anyway. I don’t recall when those other Spider-Man comics in question came out in relation to 252, since I wasn’t reading those at the time and didn’t pay any attention. Oddly, not all that much demand for Deathlok. …two copies of the same comic! 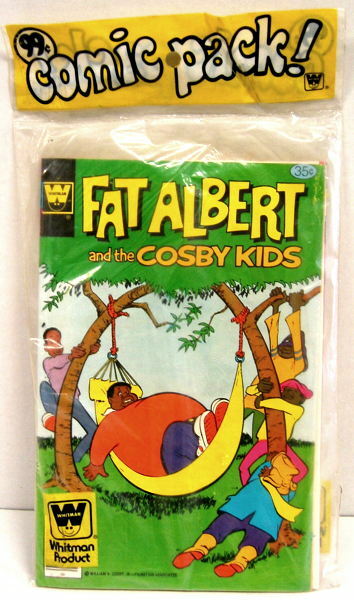 That’s Fat Albert and the Cosby Kids #25 (from June 1978) on the front there, there’s a copy of Woody Woodpecker #168 on the other, and, in the middle, another copy of Fat Albert and the Cosby Kids #25, espied by me by carefully separating the comics while still inside the polybag. Well, I don’t know about you, but if I shilled out my 99 cents and got two of the same funnybook for my troubles, I would have been a tad miffed. Anyway, none of the comics in any of these pre-packed bags are in particularly high demand…I mean, there’s some demand for cartoon comics like Fat Albert , but the packs themselves as is will sell more quickly for us as novelty items than waiting for collectors to request the specific issues therein. Of course, that’s not always the case. 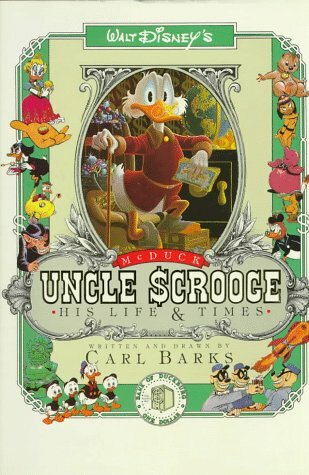 There are a handful of issues from various series that were only distributed via the Whitman three-packs and not as a racked single issue, most famously (and expensively) Uncle Scrooge #179. A copy we had about — oh, ten years ago, maybe? — sold in the $300 range on eBay, and it was around a Very Good to Fine copy, if I remember correctly. Speaking of collectability and also awkward transitions, I’ve started to have some inquiries into the first issue of Preacher , a comic that long ago stopped having any back issue demand since the primary way anyone wants this series now is via the trade paperback/hardcover editions. Which is fine, I sell plenty of Preacher books, which has more than made up for any dead Preacher backstock we’ve had sittin’ around, but now that people are getting wind of a television adaptation, I’d better dust off that section of the back issue bins for the brief period of time that they’ll be sought after again. Plus, the return of Doomsday is resulting in multiple requests for Superman: The Man of Steel #17 (Doomsday’s first appearance) and #18 (the start of the “Death of Superman” story). I assume that’s what’s causing it, and not some spontaneous uprising of Doomsday nostalgia. Or maybe he’s in that Batman/Superman movie and I haven’t heard about it? I mean, everyone else is, so why not. 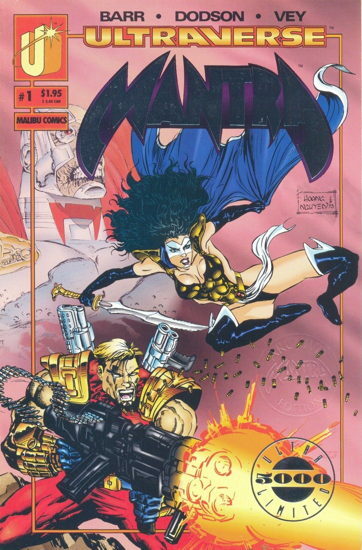 I’m also looking forward to the eventual revival of interest in Heroes comics and merchandise. I mean, all you folks loved Heroes , right?